When Gibson first introduced its SJ-200 jumbo-bodied acoustic guitar, musicians from a range of genres took to the instrument for its ability to project over a loud band situation. Since then various guitar manufacturers have entered the jumbo body guitar market, with various degrees of success. 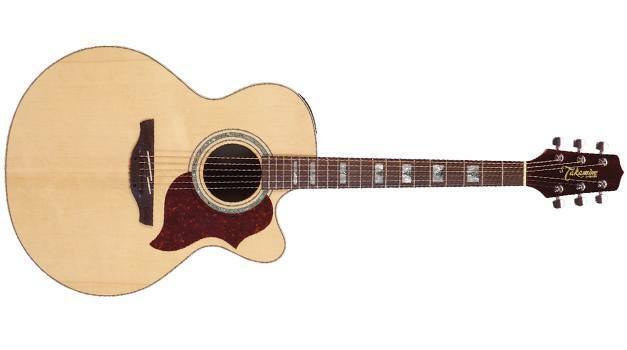 Takamine's now discontinued EG523SC is one of the more successful models in this space. Takamine claims that they make the “world’s hardest working guitars,” but you can’t deny the fact that they also make some beautiful looking instruments. At first glance the EG523SC looks and feels like an absolute beast, but on closer inspection feels more like a slightly larger-than-life piece of art. Attention to detail seems to be the name of the game as far as the cosmetic appearance of the Takamine EG523SC goes. The guitar’s frame is constructed of a handsome 16.7” solid spruce top which sits on top of beautiful flamed-maple sides and back. The guitar’s neck too is made of flamed-maple and is lacquered to a stunning gloss finish. The fretboard is rosewood and is adorned with beautiful mother of pearl and abalone block inlays. The guitar’s dressing is topped off with a beautiful abalone inlay ring around the soundhole and a curvy tortoise pick guard. One of the unique features about the EG523SC is that it features a split-bridge with a separate saddle and pickup mechanism for the top B and E strings. This combined with the non-pin bridge lets the guitar’s string vibration carry beautifully to the tonewoods, helping to create a wonderfully balanced, rich sound. The projection is great on each individual string and the guitar sounds like an absolute beast when used for heavy rhythm strumming. Traditionally maple-backed acoustics tend to sound a bit brittle and thin, but that is not the case with the Takamine EG523SC. The guitar’s large body combined with the tonewoods does a great job of producing a colorful but sturdy tone that sustains for ages. The EG523SC features Takamine’s upgraded TK40 pre-amp system with three-band EQ, notch filter and mid-contour switch. The TK40 also features a highly responsive tuner and bypass switch which allows you to bypass the unit’s EQ altogether and color the guitar’s sound solely with an amp or mixer. However, care should be taken when tweaking the guitar’s treble sounds when plugged in so as not to end up with a clangy high end. The great thing about the Takamine EG523SC is that it’s built like a tank but also feels comfortable in your hands. The glued on neck feels sturdy but also resonates beautifully in tandem with the body. The body can feel a bit bulky at first but the cutaway helps the guitar rest comfortably in your lap when playing seated down. The EG523SC does a great job of combining projection and a warm but full-bodied tone, and at the guitar’s $400-$600 price-point is a solid investment.